Good Morning!! 1st of all, I want to THANK EACH & EVERYONE OF YOU for making me hit 100,000 hits on my blog yesterday!! whoohooo!! I am inviting you back here tomorrow, same time~same place for a little surprise!! Okay, now, today is a VERY SPECIAL day~ it is Angel (my Baby Girl's) Birthday today! Angel is "4" years old!! She is such a Princess! Her & I stick together since we are the ONLY Women in our house! lol.. So, since Scrappy made his cameo on camera for his birthday last week, I wanted to make sure Angel had her moment Also!! She is the SWEETEST & MOST LOVABLE doggy I've ever had! Anyways, I wanted all of YOU to meet her & I wanted to share this 8x8 scrapbook page I had made for her using my Gypsy! I kept this video very minimal because I wanted to go to bed at a decent hour tonight!! lol..... So I can understand if you would have questions! If you do have any, go ahead & click on the "Contact" cricut cartridge on the top of my blog & you'll see all my information there! So I hope you enjoy it & if you can, please leave Angel some love for her Special day! I layered the pattern paper onto Black cardstock so my little bones will show up Perfectly! Thank you SOO much again for ALL of your Sweet & Encouraging comments! I will see you back here tomorrow for a Special Surprise!! Our animals become such a huge part of our lives don't they. We have one dog, two cats, a turtle, two goats, 24 hens and I love them all! oh my- SO cute. the rhinestones are such a neat addition. I made a layout with this dog too because it's so cute! Angel you're so cute! Happy Bark Birthday Bark Bark Angel Bark! Wonderful lay out. Thanks sooooooo much for the videos they help so much! Congrats on the 100 000, i started following you at about number 15 i think and now you have over 600 wahoooo. Happy birthday Angel-you girls have to stick together.Thanks Emma once again, where do you find the time-nearly a video everyday. Angel, you were so pretty in your video. There is a reason that dog spelled backwards in GOD. They are one of his special blessings to humans. Happy Birthday Angel. Awwww--Happy Birthday Angel!! And it is such a cute layout that your Momma made for you! Happy Birthday Angel !!! you are so sweet! I wish I could give you a H B in person but this will have to do. Have a great day with Mom. What a really cute page.. love it ! Angel is so cute. Happy Birthday Angel!! Your layout is really cute, Angel will love it. Hi Emma.... Love the Layout! I know what you mean about being the only girls in the house, same thing here!! Happy Birthday Angel!! So cute, Happy Birthday Angel, what a good puppy!! Great page, thanks Emma. Great layout and I love the way you did the bones I would never of thought of cutting them like that. Super cute dog you have, happy birthday to Angel. Happy Birthday Angel! What a beautiful birthday girl you are!! Hi Emma, love the puppy dog stuff! We have a red poodle who we are very attached to, he is 11 1/2 years old - Kirby is his name. Love the Angel hugs too! Adorable layout just for you...so cute!!! Love Love the videos. Thanks for sharing. How sweet your little Angel is,happy birthday Angel. I love the page it is so cute. Happy Birthday Angel!!!! My girls were drooling over how cute she is and that she gives hugs too!!! The LO is perfect (as usual). I love that you "cheat" the images on the Gypsy (push what you don't need off of the mat). I do it all the time too! Why cut out everything and waste paper, right? I had to find a way around not having the hide selected contour thing. I will be SO SO SO HAPPY when that update comes out!!!! Emma - You really and truly inspire me. I just love your scrapbooking style! TFS!!!! Happy b-day Angel! She is very cute!! Love your LO! TFS! "HAPPY BIRTHDAY ANGEL" your a very lucky girl to have a mommy like Emma....hugs and kisses Emma and Angel....too cute and love how you look in glasses...hehehehe. Happy Birthday Angel - your momma is so super sweet to make this adorable card for you. Happy Birthday Angel!!!!!! Hope you and your Mom (Emma) have a spectacular day! Happy Birthday Angel and many more. I love the page Emma. Fantastic layout. My gypsy just arrived this weekend so I loaded all my cartridges onto it whilst watching my daughters soccer practice. I am now re-watching all your videos- I just wanted to say thank you, I have learned so much from them. Happy Birhtday to you! Happy Birthday to you! Happy Birthday dear Angel Babyyy! Happy Birthday to you and many moooore:) We do love our babies don't we! In our home my husdand is so out number we have girl power there!!!! I love the little tiara on the puppy! happy birthday angel...you re such a cutie patootie! How super duper cute!!! My Peachy Keen critter faces showed up today-yeah-I can't wait to play! I tried to make a card like your yesterday--mine wasn't a success like yours was! Mine ended up in the trash! Happy Birthday to you Sweet Angel..woof woof!! Love the layout of your scrap page...very cute! "Angels" were halo's not crowns!Just joking!LOL, but a good idea for the the birthday cake piture to follow! Happy Birthday Angel. What a cute little dog, she looks like a good girl. awwwwwwwww happy birthday to you, happy birthday to you, happy birthday dear angel ahappy birthday to you!!!!!! Happy Birthday, Angel girl! You seem like such a sweet baby! Nice job and thanks for sharing. I love wathing your videos....keep them coming. Happy Birthday Angel! Your Mommy has made the cutest layout just for you on your special day. Give her lots of love! Happy Happy Birthday Angel! Mommy sure made a beauiful page for you! Angel, you are a real cutie. Be sure to give your mommy lots of hugs for making you this special page. Happy Birthday. Angel - I am sending you mad birthday love from my pack of dogs: Charlotte, Shakespeare, Nutmeg, Pumpkin, Maximus and Bronte. They all wanted Angel to feel the love for her birthday. Cut layout Emma. Grats on your hits. Ask your mom how she gets her stitching so straight with her pens. Adorable layout, Emma and oh-so-cute Angel- Happy Birthday!!! Happy Birthday Angel! Many more. I know you are proud of your mom. She's the best! Now that is "dog-on" cute! Thanks so much for always sharing your cute projects! Great job Emma and hope you had a great birthday Angel. You are so precious. Our pets are so very special. I love the cut-outs idea! Happy Birthday Angel!!! I love your little card and you are such a cutie! I hope you have a very special day! Very cute layout. Happy Birthday Angel! Congratulations on 100,000 hits, Emma!!! Yippee!!!!! Happy Belated Birthday Angel! May today be a happy day and all the days ahead! Such a cute LO too! Super sweet layout and I love Angel! She is adorable. Happy birthday to Angel! Have a great day and I hope you get some extra treats for you birthday! My three doggies: Missie, Marlie & Mazie are sending puppy hugs and kissed to Angel! Happy Birthday Angel!!!!!! oooh these characters are sooo cute!!!!! 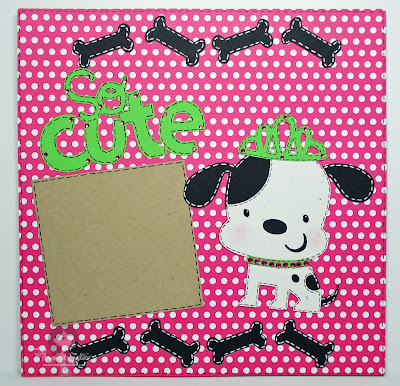 Way too cute of a layout...and birthday doggy :) You got my brain a moving with the bone 'cut-outs,' thanks for that. Sooo cute! hope your little one had a great birthday!! such a cute LO. TFS! !